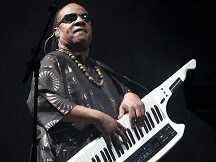 Stevie Wonder plans to headline in Sin City on New Year's Eve, playing to a ballroom crowd at the Cosmopolitan of Las Vegas and to thousands of revellers on the Las Vegas Strip by video. Casino officials told The Associated Press the 25-time Grammy winner, known for top hits including Superstition and You Are The Sunshine Of My Life, will be its top performer one year after an exclusive grand opening bash that featured Jay-Z and Coldplay. This year's party is slightly more accessible than last year's invite-only affair - a limited number of tickets start at 250 dollars and include an open bar. The New Year's Eve show caps a year of entertainment at the Cosmopolitan that featured top acts including Adele, and the Flaming Lips. Stevie's concert will stream to party-goers on the Las Vegas Strip, which will shut down to vehicle traffic and fill up with tourists. Lisa Marchese, the Cosmopolitan's chief marketing officer, said Stevie has proven over several decades of performing he can appeal to audiences young and old. In June, the former child prodigy was honoured at the Apollo in New York with induction into the Legends Hall Of Fame, joining Aretha Franklin, Michael Jackson and Ella Fitzgerald.